There are two seperate parts in this kit. 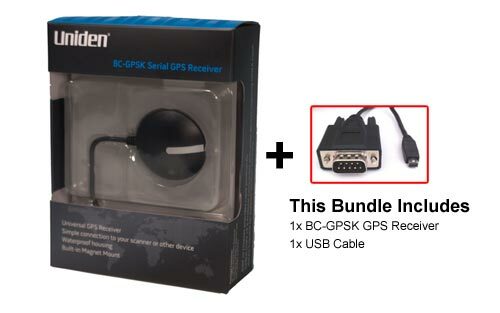 The BC-GPSK GPS receiver - as packaged by Uniden and we've included the required (but normally sold separately) USB cable to make the connection to your scanner. Since the BC-GPSK will not work without the USB cable, we have opted to combine these two required parts into a single product. This bundle is ready to go for the Uniden HomePatrol-1 Scanner. Adding these components to the HomePatrol will allow the scanner to automatically detect and scan for frequencies in the area that you're in based on the GPS coordinates. If you want to completely automate your Uniden Homepatrol, these parts are required. The BC-GPSK Serial GPS Receiver provides a simple solution to connecting a GPS to your Uniden location-based scanner or other NMEA-compatible device. The included cable plugs directly into a DB-9 RS-232 port. 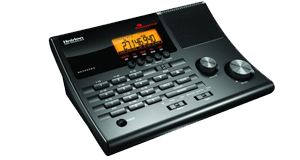 The Uniden GPS adapter cable easily connects to Uniden handheld scanners and the HomePatrol-1. The compact GPS design includes a magnetic base to easily secure to your vehicle. Its weatherproof design allows outside mounting for best satellite signal reception.